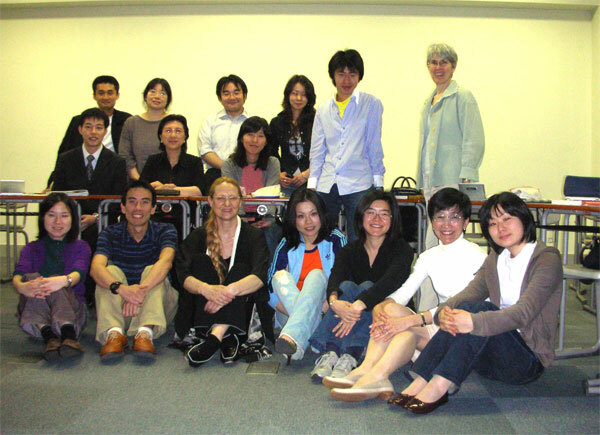 Graduate School of Intercultural Communication, Rikkyo University, Tokyo, in Professor Adair Linn Nagata's Course of Intercultural Communication, June 8, 2006. Lecturer: Evelin Lindner. Here is a revised version including comments from one more student. They all agreed and several said they were honored to be part of your work and your website. Here's an explanation of why I use the term feedforward instead of feedback. Feedforward is a term coined by Marshall Goldsmith (2002) to emphasize the expansive and dynamic possibilities people have in the future rather than focusing on their limitations in the past. I have been using feedforward with students to emphasize developing new ways of feeling, thinking, and behaving in the future rather than dwelling on the past, because it seems more appropriate than feedback for students who are oriented to putting what they are learning to work. Feedforward sheets (FF) require students to reflect on how they will apply their learning from reading, writing, and class experiences and are submitted by e-mail after each class. Goldsmith, M. (2002, Summer). Try feedforward instead of feedback. Leader to Leader, 25. What idea interested you most about today's class? Our guest speaker wore kimono to show her respect for Japan. The idea was interesting. Dr. Lindner’s idea that humiliation is the main factor which causes conflicts, was very interesting. I’ve never looked at the problems from such a viewpoint. Also, her concept of “Egalization” interested me very much. I wasn’t really able to understand the way Dr. Lindner connected her idea to the studies of the intercultural communications… I’ll try to review at her website. I’m interested at the present is turning point of the times period. d) Her way of starting presentation, that is, her performance. The presentation per se had not changed so much since last year; however, it was interesting as some knowledge of Japanese (words) was incorporated. She talked about intercultural communication from the viewpoint of humiliation. That was interesting. The most interesting point was, she thinks that we are in transition from hierarchical society to equal society. (These words “hierarchical society” and “equal society” may be incorrect, I don’t remember.) People talk about “globalization” a lot but I’ve never heard of such transition. I’m not sure that is the case, though. The historical dimensions of the society started off with isolated collectivism, than became powerful and hierarchical collectivism, which has currently formed into a single global village, was interesting. It was also interesting to know that the “quality of life” has historically continued though it was forgotten during the powerful and hierarchical days. I got an impression that protecting security and participating in society for a quality of life, seems to be separated. From this impression, I thought that an institutional system to promote dialogue among people and cultures are necessary. This is because, if individuals get isolated, people may become self centered and not become part of the society, or just follow what the loud voice says. The notion of the importance to recognize the role that histories play in our identities and the ways in which the past - present dialectics helps us understand different identities for others in various cultural groups: I am sure that this will make intercultural communication more fruitful and avoid misunderstanding or stereotyping. Humiliation can occur because of ignorance of the personal history. To capture issues all over the world with the idea of humiliation was interesting. It is, at least for me, easier to pay attention to the material world for seeing the world’s problems, for instance, by seeing the number of dead people. Numbers or things show us what is happening and it is easy to understand. But I realized that people do not only suffer from material problems but also from psychological problems. To think about the psychological side would be more difficult because of its invisibility, but it is important to try to see that side. The idea about sunflower identity was the most interesting to me as I always ponder about the aspects of my identities. Not only that but other concepts, such as new technological means, dynamics of humiliation, and so on, I would like to explore more by revising the article posted in her URL. Her presentation that was using her whole body in order to communicate her idea to us was very appealed to me. I was impressed by her passion that was coming from her authentic voice. Do you have any comments for our guest speaker? I’d like to express my thanks for great and though-provoking presentation. It made me reconsider humiliation. I feel the speech was wonderful and I respect Dr. Evelin Lindner because she is put her idea into practice and also I like the 3 point of problem solve principles, it is quite right; however I had some doubts about that how to solve a problem of the power or humankinds desire. We of the humankinds have ceaseless greed. (Appetite, greed for sleep, greed for money, honorary desire, greed for self-realization, and so on…) So I’m just a little bit confusing about how to resign elites position they (elite) self. I understood we have a responsibility for present situation (rich and poor, environmental disruption; ecocide etc…) but it is the result of the power competence, and we are living in the power (force) competence society. It is so to speak we (bio) have to eat bio and bio needs to eat bio. We are just only a part of the earth. And we have to get food or resources to alive in this world. I feel it is inevitability instinct of life. I can discuss the issue of the gap between me and other poor people with my classmates. And maybe some of us might write about this issue in theses. But when I think about this kind of issue, I always feel miserable. Because actually I do not know what to do exactly. I can make a voluntary little contribution to them. I can do some volunteer work. I do not think it is very practical and effective. It was thought-provoking and therefore there is nothing much to say. As she lived in some other countries, learned a lot from their cultures, and finished up her doctor’s thesis, I thought I might want to consider living in another country to transform my Self to a better/improved Self. On the other hand, if I dare to say two things, one is that Soseki Natsume is first of all known as a novelist; the other is that her theory of desire was sort of based on Maslow’s theory, which seems might be traditional, I am not so sure, though. She seemed very passionate. I was very impressed with the way she talked and I got drawn into her talk. I would like to learn about the practical ways in education for acquiring the skills to maintain equal dignity and live together. The presentation by Dr. Evelin Gerda Lindner impressed me very much. I have often been thinking of humiliation, especially humiliation among nations and ethnic groups. I was thinking that humiliation can cause serious conflicts or worsen existing ethnic issues. Her idea is inspiring and encouraging. However, I am afraid that the notion of commonalities and differences which Dr. Lindner mentioned are understood in the western contexts and there is too much generalization. The way Dr. Lindner talked is always clear, persuasive, and conscious about listeners. While talking, she all the time tried to communicate with us, paying attention if we understand what she said or whether we agree with her or not just as Nagata sensei also takes care during class. It gives me some ideas about how good presentation and interaction should be. Dr. Lindner gave us a deep, thoughtful speech in an interesting and easy-understanding way. With my very limited understanding of “Communism”, I think her “Sunflower Identity” is very ideal and a sort of similarity to it. Buddhist concept in terms of dignity of life may help the guest speaker’s study. The idea of quality of life was little bit difficult to understand. I understood the guest speaker’s idea what important is not quantity but is quality. I think that how to define life’s quality might be different for each person, in other words how to feel satisfaction would be different for each individual. As I was participated in your lecture in the middle of it, I probably did not understand your concept deeply, but what you told us was very important for our future, meanwhile, I felt cultivating and changing people's awareness regarding these kinds of issues were very difficult because we are such a big whole. However, your presentation was very impressive and I thought that many people would be moved by it for future. Thank you for your presentation and please keep taking an initiative to facilitate our awareness about these matters.